Kahneman is a well established name in Cognitive Psychology, and his theories were the basis for my PhD dissertation in distance learning. His Nobel prize is in economics because his research has such strong implications for marketing, purchasing behaviors, and consumerism. 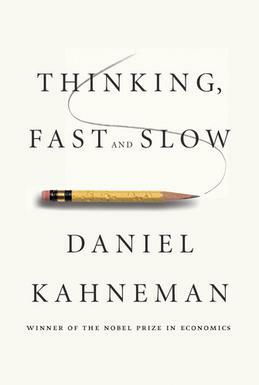 In this book, he explains two mental systems: one is fast and somewhat automatic and the other is slower and more thoughtful. He explains how people come to decisions somewhat impulsively and illogically. The book is written very conversationally, and is easy to read, albeit it's quite long (499 pages!). It has interesting implications for marketing as well as for data collection. Below is a video of Kahneman himself discussing the two types of thinking. Enjoy!